Intraoperative heart rate is routinely measured independently from the ECG monitor, pulse oximeter, and the invasive blood pressure monitor if available. The presence of artifacts, in one or more of theses signals, especially sustained artifacts, represents a critical challenge for physiological monitoring. When temporal filters are used to suppress sustained artifacts, unwanted delays or signal distortion are often introduced. 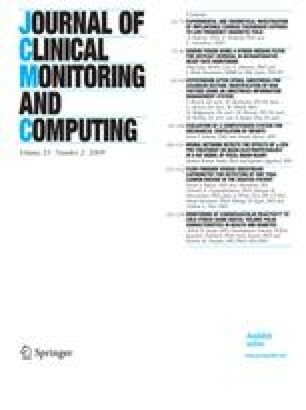 The aim of this study was to remove artifacts and derive accurate estimates for the heart rate signal by using measurement redundancy. Heart rate measurements from multiple sensors and previous estimates that fall in a short moving window were treated as samples of the same heart rate. A hybrid median filter was used to align these samples into one ordinal series and to select the median as the fused estimate. This method can successfully remove artifacts that are sustained for shorter than half the length of the filter window, or artifacts that are sustained for a longer duration but presented in no more than half of the sensors. The method was tested on both simulated and clinical cases. The performance of the hybrid median filter in the simulated study was compared with that of a two-step estimation process, comprising a threshold-controlled artifact-removal module and a Kalman filter. The estimation accuracy of the hybrid median filter is better than that of the Kalman filter in the presence of artifacts. The hybrid median filter combines the structural and temporal information from two or more sensors and generates a robust estimate of heart rate without requiring strict assumptions about the signal’s characteristics. This method is intuitive, computationally simple, and the performance can be easily adjusted. These considerable benefits make this method highly suitable for clinical use. Yang P, Dumont GA, Ansermino JM. Sensor fusion using a hybrid median filter for artifact removal in intraoperative heart rate monitoring. The authors thank William Magruder for his valuable contribution when editing this paper.